I've added a new "live feed" to the site which doesn't appear to have the problematic links associated with our previous one. Continuing on with the cactus photos, this is Lobivia schieleana in flower last Spring. Of course they're resting now - hibernating for the winter. They're smart. Can we also get permission to just pass through all this drab gray stuff and move on to Spring. OK. I'll wait until after the holidays. But then...please! You'll note that we've removed Feedjit from our Blog. We've done this since McAfee has identified it as being linked to sites which may not be safe for our blog or the computers visiting our blog. We will miss it as we enjoyed seeing where our visitors are from, but we don't want anyone to be unsure about the safety of our blog. Thanks for your understanding. As I indicated, back to some cactus photos taken earlier this year - especially uplifting as the rains come in from the coast tonight. 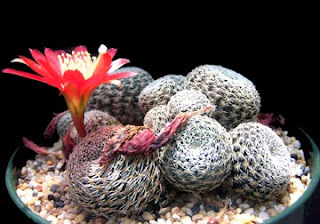 This is Gymnocalycium mostii, a quite large growing gymno with lovely flowers. It always impresses me. And another Lithops which continues to flower is the white-flowered Lithops karasmontana. Put a group of them together and they make quite a display. But, before going to the cacti, some more of what is flowering: Lithops. In this case it's one of my favorites, Lithops dorotheae. It's getting colder and more overcast, but the Lithops just keep on blooming like it's still summer. Since we're mostly past the blooming season for the cacti, I'm going to be posting some photos we took earlier in the Spring and Summer. Along with being able to see the beautiful flowers posted by our friends in the Southern Hemisphere, posting these help keep me going as we get shorter and shorter days. We end Day Light Savings Time soon and it'll be getting dark by 4 or 4:30 each afternoon. And the evenings are getting colder - probably into the upper 30s F tonight. All the more reason to post cactus flowers. More later. And today's winner is...Sempervivum 'Jungle Shadows'. This is one of the ones which get quite large. Because these are such easy care plants, they're being used along with hardy Sedums to create "green roofs". We have a lot of these being built in this area now. Another one of the classic semps: Sempervivum calcarium 'Mrs. Guiseppi'. Hardy just about anywhere, these plants do their best in rather poor soil. Who could ask for more? I don't think I've ever posted any of the succulent alpines before. Though often viewed as "common" since the multiply so rapidly and are often shared from neighbor's gardens, there are some really wonderful cultivars which show off nicely in a rock garden. This one's an old timer: Ohio Burgundy. We obtained our first "semps" back in the 60's from Helen Payne's nursery in the Willamette Valley. She wrote the now out-of-print classic "Plant Jewels of the High Country". They're often referred to as "Hens and Chicks", but of course so are Echeverias. This is "Off Topic Saturday" - at least for the next few minutes, when it turns to Sunday. This obviously is not cactus country, though some succulents grow not far from here...some Sedum in the lava beds. For those not familiar with the Pacific Northwest of the U.S. and Oregon (pronounced OR-y-gun) in particular, we're blessed with a wide variety of climate zones: From the West we begin with the coastal headwaters and the coast range of mountains, some parts of which are temperate rain forests. Next is the Willamette Valley - pronounced Will-AM-et. That's where live - in Portland at the confluence of the Willamette and Columbia rivers. This area is mild with moderate rainfall, with by far the majority falling in the Winter. Then the Cascade Mountain Range, with a series of volcanic peaks, separates us from Central and Eastern Oregon, mostly high desert. This picture is from Central Oregon on the Eastern flank of the Cascades. Just a couple of miles from this location, the Metolius River appears - full-size - from underground streams. This is at Camp Sherman which has a country store and cottages - and beautiful scenery. About 45 miles to the east and there is habitat for Pediocactus simpsonii var. robustior and further east are various Lewisias. Various Sedums are found in the lava beds, along the cliffs in the Columbia River Gorge and the cliffs along the Oregon coast. And now it's early Sunday so off to some midnight respite. Back at you with cacti and succulents tomorrow! Back to the Echeverias. This is Echeveria setosa var. deminuta plant and flower. A very easy one to grow. Another Graptoveria, this time 'Bella'. It gets quite large and the color varies by the season - as you can see by the two photos. We've been getting Ladybug out for more drives and today it was a beautiful Fall day. This picture is on the sidewalk in front of our house as we were coming home. We drove her over to the Madrone Cafe, a little less than two miles from us.It's a little coffee house owned by a French woman from Paris. Afterward, it was back up the ladder to continue putting up gutters (two floors up). I'm tired. Maybe more tomorrow. Back to the Echeverias. This one's a cultivar called 'Brown Sugar', along with its flower. There are also their fair share of yellow flowers among the Lithops. After all, yellow is the most common flower color in Lithops. This one is Lithops lesliei red form. Thank goodness for those plants which put forth their flowers in the Fall. It was white flower day with the Lithops today. Both Lithops lesliei 'Albinica' and Lithops karasmontana were doing their thing. This is another of my favorites. It's a beautiful cultivar which which came to us as Echeveria 'Etna', but which clearly isn't. (I mistakenly identified it as such yesterday.) A lot of the larger cultivars received "volcanic" names. Unfortunately, most of what's available here in the U.S. are un-named cultivars, usually some kind of cross built on E. gibbiflora. I'll post a couple of those this week. Well, it's pretty obvious how they came up with the name for this plant! 'Blue Curls' is always in great demand. One of the problems with Echeverias as a nursery is that we can never keep them in stock. Their popularity in South Korea and Japan is fantastic. Lynn-Marie propagates like mad, but it begins to wear her out at about this time of year. And besides, she's an artist, and she needs to be working on her art! This is Echeveria 'Violet Queen'. In warmer weather it tends to stay a powdery blue color. The best color comes with the cooler weather. We got all our plants into the greenhouses just in time for the weather to warm up a bit. And the next few days should be soggy wet. However, back in the greenhouses, the Echeverias are looking nice, showing their color well. This is just one small section of (mostly) Echeverias in the larger of our two greenhouses. I'll be posting some individual Echeverias and related genera in the next few days. We have a Pacific storm arriving this week - actually three storms - bringing with them our first real Autumn weather. It'll be windy and a bit wet. Welcome to Oregon - at least Western Oregon. It almost makes me yearn for Nevada and the sunny, open spaces. But then I look back at this photo of an old - dead - motel in central Nevada and remember why we like it here in Western Oregon! And pretty soon Nevada will begin to get quite cold. I'll take the rain. Yes, the weather in Southern California can be ideal, but then we'd have to put up with the congestion and crowded freeways. And Southern Arizona is just too hot in the summer. And so, here we are, in wet and windy Portland, Oregon, and not complaining. Oh, and we did get the plants out of the weather in time. This is another one of those plants we've had around forever...well, for at least 35 years. We just call her "Twiggy" - except on formal occasions! (The name comes from the Greek 'kynos', dog and 'anchien' to choke, referring to the toxicity of the plants, but our dogs have never shown an interest.) The flowers start out as little "bird cages"...quite cute. Suffice it to say, these fit in nicely with our many haworthias. Back with another Haworthia. What can I say; I like haworthias. This one is Haworthia coarctata. I'm prejudiced of course, but I think Lynn-Marie, my marriage partner for the last 41 years, has a special touch when it comes to growing these beauts. While in the greenhouses today, moving plants around to make room for more plants - what else? - I noticed Euphorbia susannae flowering. It can be readily missed, but it's really quite attractive. I didn't have time to get out the closeup lens, so just a snapshot will have to suffice. Back when I was posting Haworthias last month I don't think I posted this one: Haworthia kingiana. Sorry for the oversight. It's actually one of my favorites. Just a quick photo tonight as I have to get up early tomorrow to have some blood tests done and then to get some prep work done for a new dental crown. A fun morning. What could be better than a nice mesemb flower to get your mind off dental work? While moving plants around in the greenhouse, trying to make more room, I was reminded of this nice Agave: Agave filifera ssp. schidigera 'Shira ito no Ohi'. The origin of this cultivar is not known, though it's been around for quite a while under the name Agave filifera 'Compacta Marginata'. The name was added by Plants Delight nursery and means "Queen of the White Thread". We've always liked Agaves, but in recent years have been impressed by some of the new cultivars. In addition, we've become aware that many are quite hardy and can survive even our wet, cold winters, given enough soil drainage. Unfortunately this may not be one of them, though it appears to be hardy to 15 degrees F. But it stays small enough to make a great potted subject. I'm afraid I've been really busy getting the greenhouses ready for winter. Our night-time temperatures are dropping into the low 40s (F) and may get into the upper 30s by next week, so...it's the annual battle of trying to get all the plants that need protection back in the greenhouses. But there's never enough room. What we need is a larger greenhouse! 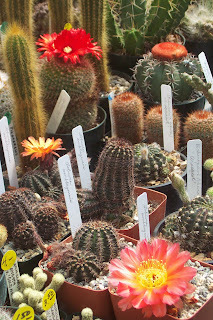 So, just to get my mind off all that kind of minutia, I've reached back to a Spring photo of Lobivia saltensis. I guess I'm kinda feeling like the owner of the coffee house we go to in the morning for a latte and cappucino. (She's from Paris and runs the Madrona Hill Cafe here in Portland.) I asked her how she was and she answered that she was eagerly awaiting Spring! So why not? 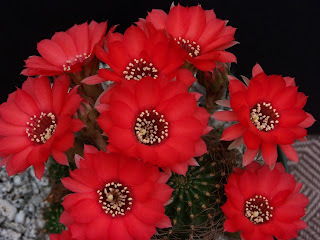 A shot of cactus flowers from the past to help ease us into the cooler months which lie ahead. We're back from a relaxing couple of days at the coast. The picture below is of a Mammillaria "ring" crest. These aren't very common. In all our years of growing cacti, this is the first one we've had...and it's a dandy. We'll be putting this up on E-Bay sometime soon, but it won't go cheap. In the meantime, I'll share a couple of photos of it...but just this one tonight. More later. It was nice at the coast, but it's good to be back.